We proudly present ourselves as a noted manufacturer, exporter and supplier of Diamond Core Drill (Z1Z-TK2-300A) from Yongkang, China. Suitable for drilling on level grounds and vacuum platforms, this Diamond Core Drill is offered by us with safety clutch, overload protection switch and Electric Leakage Protection. 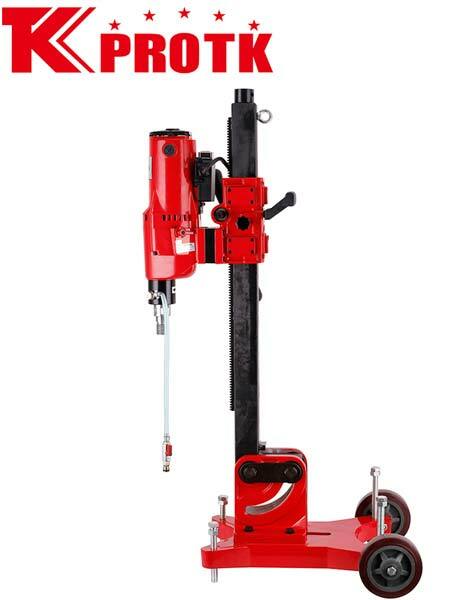 We offer this Drill with two-gear rotary speed, so that holes of different sizes can be drilled. This Core Drill comprises of an adaptable water spigot for wet drilling. This Drill works with a maximum rated frequency of 50/60 Hz. Big A type base with wheel and vacuum plate and adjust angle stand 0-90.